It was just a normal night; Jo was doing her usual work when she got an urgent message from Jonathan, the writer of that amazing comic The Terrible Turtle Conspiracy. She thought about ignoring it, but then decided it might be important. The last time she’d spoken to him, he said he was on to something that was so big, so unbelievable, that it might change the world forever. Little did we know he was right. 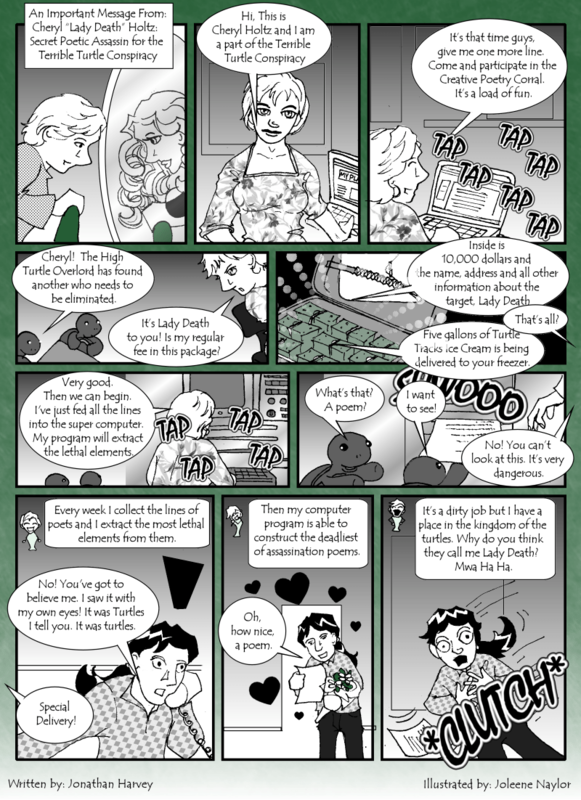 I know it may be hard to believe, my friends, but our own dear, sweet Cheryl (who used to run the Creative Poetry Corral, a fun group where participants – or pals – left poetry lines for one another to use in constructing weekly poems) is not what she appears! You don’t believe me, do you? I can feel you not believing me. Well – here is the evidence!! That’s shocking isn’t it? To think that the weekly pal poetry lines have been used in assassinations all the world over? On the other hand, it kinda makes all the pals famous, though. How many people can say that their poetry was used to assassinate someone? We must not think like that! That’s what the turtles want! They want us to be excited! They want us to all be sure to check out the CPC! They want us all to leave lines and participate in the weekly challenges! And how can we say no? 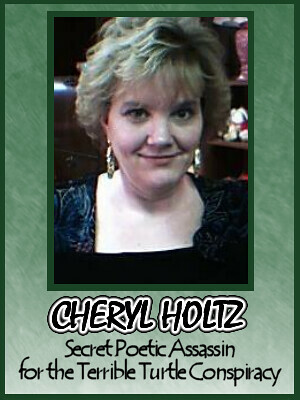 Aside from being a fantastic poet, Cheryl was the organizer and driving force behind the Creative Poetry Corral. It is greatly missed.